David "Stu" Green was introduced to music at very early age with his uncle, who played square dance music. Music has always such a part of him: performing, listening, writing/creating. He played throughout high school ( mainly saxophone, played upright string bass in concert band, played tri toms in marching band). 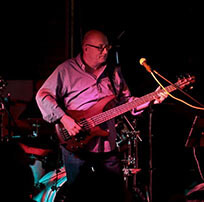 Over the years Green played with The John Doe Band, Muddy Creek Band, Blues Remedy and most recently Stu and the Brew. He's always featuring with multiple instruments in live shows and studio projects (bass, saxophone, keys, guitar and vocals). Green's musical influences include Yes, Rush, Roger Waters and Sting. He performs a variety of styles of music with strong influences from the blues.